I was interviewed by Chennai Times a few days ago, and though I did not expect it to come as a full page article (I just thought it will be a box somewhere). Another thing that needs to be noted, the media and generally too many people have been assuming for a while that I won the national award for Kannathil Muthamittaal. Though it is nice to know that everyone believes so, it has to be noted that I am not yet a National Award winner, but I hope to someday. Like anyone else. To be precise, I won the Tamilnadu State Government Award. Nice article with some mistakes. 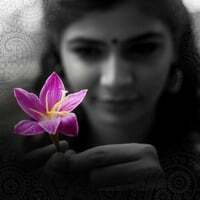 U gave dubbing for Tanisha for the film "Unnale Unnale" and not "Ullam Ketkume". Won't they go thro the article before sending it for publication? When is ur arangetram? We are waiting for that. Inform us well in advance. U look gorgeous in that photo with ur trademark smile :D and thanks for changing the sleepy photo from ur profile and including this fantastic casual photo. Hola ! Nice article. Way to go ! BTW; You look good in this pic chinmayee . Oooh ohh. I forgot; Congrats !!! Congratulations on the article! You will definitely win the National award some day. In fav. actors list ,u have clearly mentioned all big names without leavng anybody..noplace 2 simbhu n danush it seems:)Favourite singers(male)-krish,Naveen..Thats interesting..If u had any good experience with KRISH,please share.He s 2 good in comunication n he s jovial..Is there anyway i cld contact him (by mail/blog)??!!?? 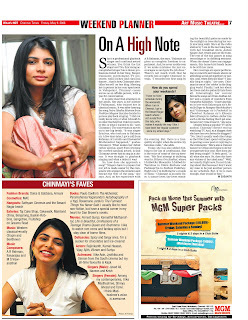 Congrats Chinmayi... u will win many more awards. Do try out the books "Atlas Shrugged" and "Fountainhead" by Ayn Rand wen u find time. Am sure u'll like them.